So you're 7 and you've been eating cheese puffs in your underwear. Do you have a napkin? Of course not, you're 7 and partially cared for by dogs. What to do with the cheese dust? I, being the one with better powers of deductive reasoning, pointed this out to my wife. She says "Oh, I noticed that last night! I was wondering what it was!" So yes, he slept in his cheese dust covered underwear. So we made him let us take a picture. "Do you want a pop for making a mess and unauthorized chip eating, or a picture?" You can tell how that went. Final punchline: we let him go for a bit so we could make a blog post. A few minutes later, we decided that maybe he should take a bath and change his underwear. I just tried the test call and 4 out of 5 times this worked for me. I then made the daily call which worked the first time. That is reliable enough for me as the TiVo carries enough data at a time and tries enough times to ensure I get my updates. If you've arrived here and need a voip service that works with ooma, buy one through this link and support theroblog. I have a Sony SVR-2000 and I'm using the dialup modem to update the guide over the ooma VoIP service. Don't laugh, I paid $20 for it at a garage sale and it has LIFETIME service! I have Comcast cable as my ISP. 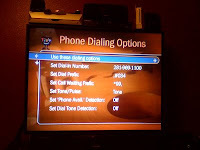 On your TiVo just set these settings under Phone Dialing options on your TiVo. Alternately you can use ,#019 as the Dial Prefix. This slows the modem down even further. Turning off phone detect and dial tone detect and using a filter in the phone line can also help if your TiVo won't dial due to a modem hardware breakage issue. That fixed mine.